Spanish Rice Recipes, Dishes from Italy - Risottos and Paellas - all wonderful and satisfying - all easy to make when you follow our step-by-step Recipes. Rice has been a staple of the Mediterranean Diet for thousands of years and it's interesting to see how each country treats it differently, and how we interpret the dishes and adapt them to suit our, generally, more Western tastes. We prepare every dish in our own Kitchens before we write the recipes and then we photograph the finished article - so you know you're getting the Real Thing. Scroll through the list of dishes until you come to one you fancy and then just click on the link for the full recipe. Just look at this delicious Seafood Paella...it's so easy! 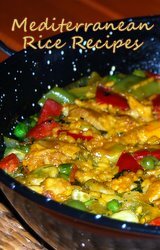 Chicken Paella - "Pollo con Arroz"
An authentic and easy Spanish dish to get you Started. 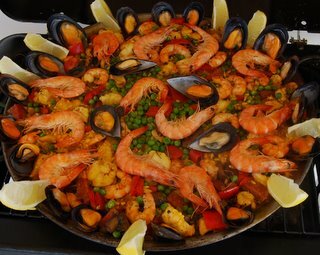 Super Seafood Paella Recipe - Classic and Authentic. Vegetarian Paella "Paella de Legumbres y Verduras"
All the flavours - none of the meat.